Used extensively in skincare preparations; Stores well, healing and nourishing making it ideal for irritated, dry chapped skin. Good emollient and source of Oleic and Linoleic Fatty acids. Superior Humectant with healing properties that can increase the production of cells in the dermis layer of the skin. Aloe helps to keep skin firm and supple. Nutrient dense, rich, chlorophyll oil containing Vits A and D plus lecithin and potassium. 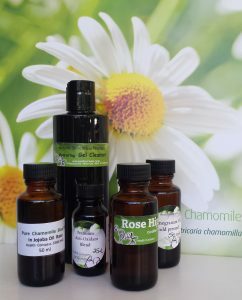 Good soothing oil for damaged and parched skin and conditions such as eczema, rashes, climate damage and mature and aging skin that is undernourished. High GLA content supports collagen synthesis and improves skin elasticity. High gamma-linoleic acid (approx 20% GLA) content ideal for inflamed skin, stretch marks and prematurely aged skin, by helping to prevent loss of skin elasticity (including through dehydration), as well as reducing the appearance of fine lines. Fatty Acids: Gamma Linolenic acid 22.3%, Linoleic acid 37.2%, Oleic acid 16.7%, Palmitic acid 10%. Cold pressed oil from the castor bean bush. Great reputation for skin repair, containing fatty acids, which helps keep the skin healthy and blemish free. 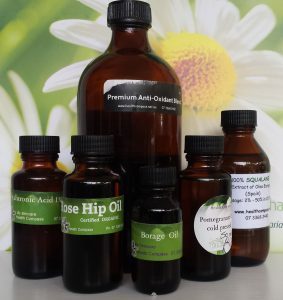 Conditions which have been responsive to castor oil applications range from, itchy skin, keratosis, ringworm, stretch marks, and age spots to arthritis, bursitis and boils to name but a few. Also great in cleansers as it lifts dirt from skin. Unrefined Coconut Oil is unique to other vegetable and nut oils in that it is a stable saturated fat, therefore NOT broken down by free radicals (Antioxidant) as will happen with others, giving it long shelf life. It’s small molecular structure allows for easy absorption, supporting the natural balance of the skin, giving both hair and skin soft, smooth texture. 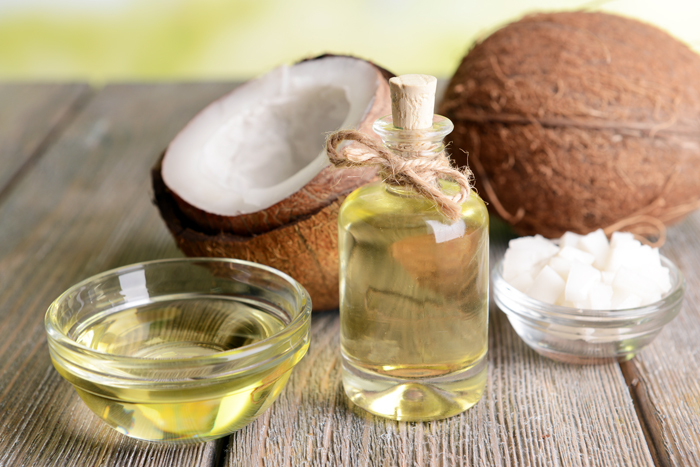 Even on it’s own a little Coconut oil applied to damp skin can be a wonderful alternative to expensive and often ineffective commercial skin creams and lotions. It has remarkable healing and moisturising properties. Best Make-up remover you can use, and is the best antidandruff control you can have. It is Antimicrobial (bacteria and viral), Antifungal, Anti inflammatory, prevents wrinkles, sagging skin and age spots. It provides protection from the damaging effects of UV light. It even has the potential to restore damage skin, as it strengthens connective tissue when absorbed into the skin. It will reduce swelling to inflamed skin, as its properties accelerate the healing process. The cold pressed oil of the cucumber is usually golden yellow and has a light, pleasant aroma. Extracts from the cucumber are renowned for their skin-tightening, soothing and moisturising effects. Add a slice of fresh cucumber to your drinking water and within seconds the oil is released from the skin into the water for a refreshing drink. Major Anti-Inflammatory oil, rich in Prostaglandin producing Gamma linolenic acid (9% GLA) and Linoleic acid which helps to repair sun-damaged, inflamed and dehydrated skin. Good source of vitamins and minerals. Often used for eczema and psoriasis. Is good for all skin types, esp dry and ageing skin. Helps prevent loss of skin elasticity and reduces the appearance of fine lines. A mildly astringent Oil which helps to tighten and tone the skin, making it useful for acne and other skin complaints. Grape seed contains proanthocyanidins, which are very potent antioxidants, helpful for diminishing the sun’s damaging effects and lessening free-radical damage and also is helpful in wound healing. A rich source of fatty acids: (palmitoleic, stearic, oleic, linoleic, alpha linolenic, icosanoic, icosenoic and docosanoic), vitamins & minerals, important for the skin and the cell membranes. A non irritating oil with regenerative and restructuring virtues and has great skin moisturizing properties. Cold pressed from the seed, contains a high level of gamma form of vitamin E and is a natural anti oxidant. It is a good natural source of Omega 3,6.and 9, and is absorbed easily into the skin without clogging. Often selected for it’s anti Inflammatory properties and used to even out skin tone. Great addition for skin that is blotchy, dry skin and helps combat the effects of the UV Rays from sun. Generally a dark green colour. Strictly speaking is a liquid wax rather than oil, making it very stable. It has natural healing and moisturising properties that regulate and balance the skin. Good in scalp treatments for eczema psoriasis and as an emollient that softens and smooths the skin, having a similar structure to human sebum. Good choice to use in your cleanser recipes. Jojoba oil contains many important nutrients, such as vitamin E, B complex vitamins, and the minerals silicon, chromium, copper, and zinc. It’s iodine content, probably contributes to its reputation fighting against bacterial and fungal infection. In addition to acne, jojoba has traditionally been used to treat canker sores, cold sores, athlete’s foot, and warts. High source of Oleic 55.0 – 62.0 % & Palmitoleic acid 18.0 – 25.0 % along with other fatty acids that helps delay skin ageing. Good emollient to rehydrate and nourish dry skin and mature or where sebum production is low. Macadamia oil is great to use since it is readily absorbed and helps to soften the skin and is also said to help reduce fine lines when used in facial massage. Generally to heavy for the skin but can be blended with the lighter oils for body and foot preparations. Highest source of oleic acid. Primarily known for its anti-oxidant properties, it is a wonderful free radical fighter. It is used to heal, protect, soften and moisturize dry, cracked, mature, and irritated skin, bring elasticity back to the skin, and for eczema and other skin problems. Pomegranate seed oil is commonly used in cosmetic products to revitalize dull or mature skin, assist with wrinkles, and to soothe minor skin irritations. It also has strong anti-inflammatory properties, which helps to reduce swelling and ease muscular aches and pains. 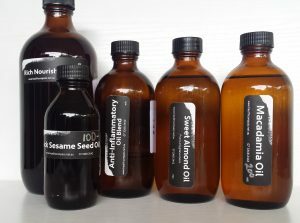 High, nutrient dense oil with good levels of protein, zinc and fatty acids and Vits A,D,E and C. It’s nourishing addition to other oils makes it good for marks, bruising and firming the skin. It helps skin renewal as it moisturizes. Essential fatty acids help regulate sebum production. The enzyme activity has a light exfoliating action, making it a good choice in cleansers ** Fresh mashed pumpkin can be added to your clay masks as it takes the nutrients straight into the skin. Rice bran oil contains several components that exhibit antioxidant properties. These include gamma-oryzanol, tocotrienols, tocopherols (Vit E), and squalene. Gamma-oryzanol is effective in absorbing ultraviolet light, thereby inhibiting a number of adverse effects attributed to exposure to sunlight. A number of sunscreen formulations incorporating oryzanol have been developed. A comparatively stable nutritive oil, that has high levels of Vit E, B vitamins, protein, lecithin, calcium, magnesium and phosphorus. In small amounts acts as a natural moisturiser and regenerating effect on the skin. A light oil that is rich in oleic acid and is reputed to contain natural protective factor against UVA rays and its vitamin E content makes it a great antioxidant. Fantastic for aged skin, sun damaged skin such as acne, ulcers, burns, including radiation, and dry and itchy skin such as eczema and psoriasis. Known as the wonder plant it is rich in proteins, organic acids, amino acids and vitamins especially carotenoids and vitamin E. It is antioxidant, anti-inflammatory and has nourishing, revitalising and restorative properties. This oil has been used traditionally in skin care for hundreds of years and is particularly useful for skin problems that require cell regeneration. This bioactive oil will also offer some protection against the harmful effects of UV radiation. It is recommended for all skin types, but is especially useful in formulas for mature skin. Another nutrient dense Oil high in Vitamins A, D, E and B complex and rich mineral source of Calcium, Zinc, Phosphorus, Iron and potassium. Good inexpensive oil that can be blended with others.